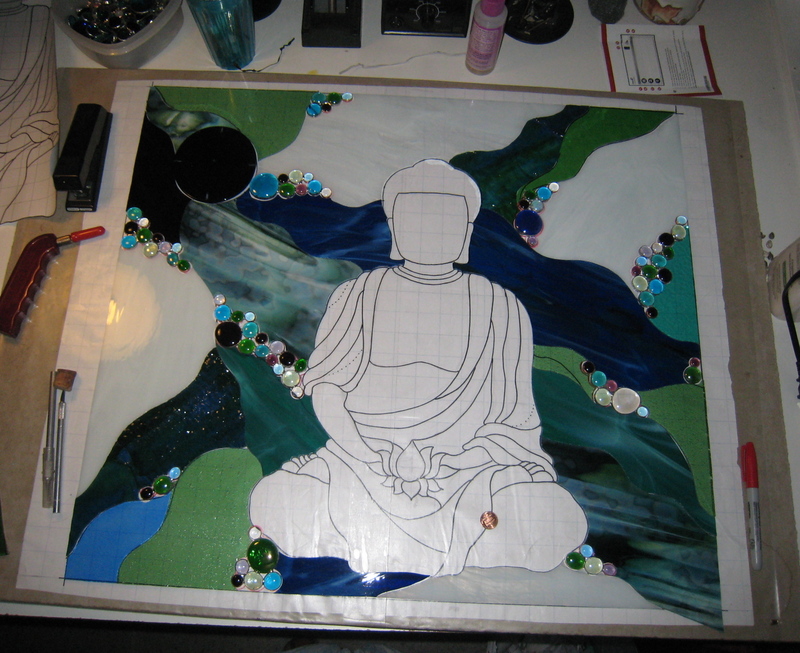 ah buddha, you are so lovely, with your cool blue and green tones. I am always struck by how dark the glass is while lying down. the circle in the corner is a roundel, darkish blue, and the piece next to it is purple, though here it looks black. His robes will be made form a sheet of glass that was found in an attic a couple houses down from me. The tenant was moving, and they found the old cardboard suitcase full of glass. He said his grandmother had done stained glass til she had a stroke about 40 years ago. It was a little treasure trove. Buddhas robes with be a rich swirled purple and clear with some streaks of periwinkle. Other sheets of glass, from that cashe, were used for the whale in Hawaiian Fling, and the coral in Peace and Quiet. The chunk of lime-ish green at his right knee is also old old glass. It is tightly packed with seeds, and is a very delicate green when the light passes through it. This piece will end up with several pieces of my favorite glass in it. Progress will slow down now for a a few weeks. I am relocating my biz, and will be spending every spare second getting that situation painted and set up to move on the 16th of February. A lot of changes so far in 2013. Lets hope they stay positive. ~ by kellig on January 29, 2013. Wow it looks beautiful so far! thank you!! sorry for the late response… this was lost in cyberland. *__* I am in LOVE! so beautiful! I actually just stumbled on your page looking for inspiration for my next glass piece–I just finished an “om” stepping stone–looking to do some chakras now. I love the use of your glass globs. I just bookmarked your site! Stunning! I am drooling haha. Can’t wait to see the finished product. but thanks for the words of encouragement. would love to see some of your work if you have photos.